Southern gospel singer and Dove Award winning artist, Candy Christmas, spoke to the Nashville residents yesterday about how her struggle with loss and grief led to her starting a local ministry to the homeless, Bridge Ministry. Candy talked about the five stages of grief: denial, anger, bargaining, depression and resolve. She shared that in 2004, while she was stuck in the depression stage, a friend took her to a local inner-city bridge where there were many homeless people living. She was moved by what she saw and began taking huge pots of jambalaya to them each week. Candy soon realized that more help was needed and began to collect clothing and non-perishable food items to pass out to her homeless friends. 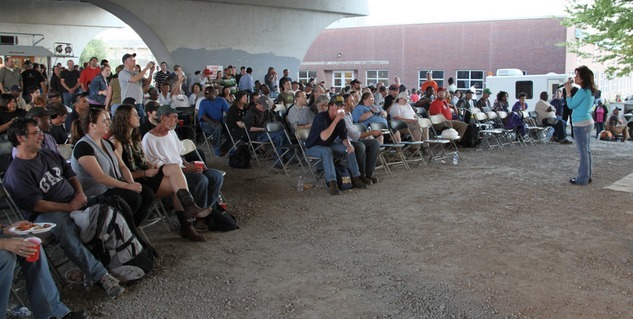 Today, Bridge Ministry helps up to 500 homeless people in Nashville weekly. Our special thanks to Candy for sharing her inspiring story with our Nashville staff and residents. Today, the Bridge Ministry is housed in a 20,000 square-foot warehouse in Nashville, TN, that stores food for Tuesday evening services as well as for other area ministries. The ministry not only includes the weekly outreach under the bridge but also an overseas orphanage in Port-Au-Prince, Haiti, appropriately named "The Candy House." For more information about the Bridge Ministry, visit www.bridgeministry.org. Candy has also written a book about her ministry entitled "On The Other Side: Life Changing Stories from Under the Bridge. For more information about Candy, or to purchase her book, go to http://www.candychristmas.com/. Five More Mercy Graduates Transformed and Free!!! A Surprise Visit From Three Of My Very Favorites! Mercy Graduate Becomes College Graduate!!! Two More Graduates Celebrate Freedom!